FORTUNE -- "Damning with faint praise" may be an overused expression, but it perfectly describes the critical reception that has been accorded the 2013 Chevrolet Malibu Eco. To begin with, General Motors (GM, Fortune 500) gets heaps of points for developing a mild hybrid system for the Malibu Eco that aims to deliver improved performance and better gas mileage at a reasonable price (base: $25,995). Technological innovation and improved fuel economy are at the top of every automaker's to-do list, and even competitors would like to see GM return to its former standing in the industry. There's a legacy attached to the Malibu Eco as well that wins it kudos. Developing a standout midsize was a signal goal for the fondly remembered Bob Lutz, who ran product development for GM. 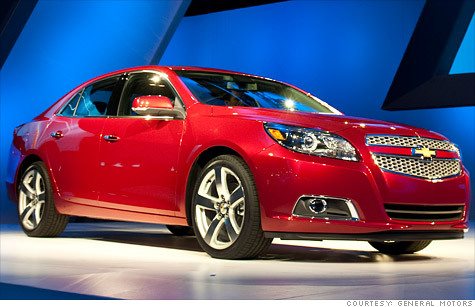 The world is watching because this eighth-generation Malibu that is the first to be sold globally. With all that at stake, the analysts and journalists who evaluate and review new cars have tried to tread lightly after encountering the Eco. Motor Trend and Road & Track have praised it for its design, quality, and quiet. Hometown Detroit Free Press raved, "Malibu Eco is a terrific car at a good price ... Its value, fuel economy, comfort and performance add up to one of the best midsize sedans you can buy." GM says 80% of the coverage has been positive. But underneath the comforting purr of diplomatic remarks, several prominent reviewers have raised fundamental questions about the Eco's concept, function, and value. They have concluded that the car compares poorly to other midsize cars in its segment -- not to mention another, less expensive Chevrolet -- and that, once again, GM has taken a wrong turn in its electric propulsion strategy. The negative vibe has been building for months. Back in December, 2011, the popular web site The Truth About Cars took a look at the 2013 Malibu and founding it wanting. Compared with the previous model, the wheelbase had shrunk by 4.5 inches, cramping rear seat passengers; the trunk was made smaller; and the handling was sluggish. Worse, TTAC found that GM's mild hybrid drive system, called "eAssist," added cost, weight, and complexity to the car while delivering few benefits. Cheaper conventional sedans got similar gas mileage, and full hybrids like the Ford (F, Fortune 500) Fusion and Toyota (TM) Camry that cost about the same were much more gas-thrifty. Reviewer Michael Karesh's conclusion: "The Eco isn't terribly fuel efficient, and also certainly isn't a driver's car." The review was an early sign that a consensus was building: In trying to split the difference between simplicity and efficiency, GM had achieved neither. In its March issue, Car and Driver compared the Eco with five other mainstream sedans and rated it last because of its "claustrophobic cockpit," "barely habitable" rear seat, mushy brake feel, lack of steering feedback, inflexible suspension, and mediocre fuel economy. GM, it seemed, had built a hybrid car with inferior fuel economy that punished drivers just the same. "The car is never much fun," wrote longtime reviewer John Philips. "It made us feel as though we were attending AA meetings to cure an addiction to Betty Crocker rum cakes." In May, AOL's Autoblog reluctantly panned the car, because after looking at its price, mileage, and the competition, it just couldn't make the numbers work. "Remember, we like the Malibu," reviewer Jeff Sabatini wrote. "We're trying to talk ourselves into recommending one. And we just might -- but it won't be the Eco. Because even though we enjoyed the Malibu Eco, we still can't see how the car makes sense, vis-à-vis the competition -- or even compared to other Chevys." The topper came in the featured review in Sunday's New York Times July 8th. Veteran reviewer Ezra Dyer took pains to explain away the Eco's design shortcomings: The shorter wheelbase -- "may be related to international-type globalization factors" -- as well as more cosmic questions about the corporate thinking behind the mild hybrid, attributing to a effort to provide all the benefits of a full hybrid without the cost and complexity. Dyer even offered a note of consolation, writing that "I suspect that I'll enjoy the other Malibus" when they are launched later in the year. In the end, Dyer concluded that GM has committed a familiar mistake: trying to find one solution to two different problems. It brings back memories of the merger of minivan convenience with sport utility appeal that resulted in -- dare I say it -- the Pontiac Aztek. In trying to combine the benefits of a full hybrid and a conventional gasoline-powered engine, the automaker came up with neither. The car lacks the fuel economy of the former and the efficiency and value of the latter. When compared with other cars -- even other Chevys -- Eco's shortcomings are stark. With a fuel economy rating of just 25 miles per gallon city/37 highway, the Eco can't lay a glove on the similarly-priced Camry hybrid, which is rated at 40 mpg city/38 highway. It also comes up short compared with Chevy's turbocharged Cruze. The smaller, less expensive (base price: $19,680) Cruze has a larger trunk and also gets better mileage: 28 mpg city/42 highway. "A smarter, more intelligent drive" is how GM bills the Eco. "Like other recent Chevrolets, the Malibu is competitive in its segment and will become increasingly competitive with the addition of the 2.5 liter engine and turbo engine later this year," a Chevrolet spokesman told me. Independent observers clearly disagree. Unlike Toyota, which pioneered the full hybrid Prius more than 20 years ago and never wavered, GM has vacillated -- swerving from EVs to hybrids and back again. With its latest effort coming up short by key quantitative standards, the automaker has inadvertently created in the Eco the most disliked car from the first half of 2012.